Boulder City High School teacher and English department chair Leslie Ringen, who had been at the school for 12 years, died on Saturday evening. She was 62 years old. Ringen had been battling health issues off and on, Klouse said, but she didn’t know exactly what was wrong. According to one source close to the situation, Ringen had been battling Crohn’s disease for many years and had a lot of health issues, although it’s unclear if the disease caused her untimely death. According to Ward, Ringen was taking a “hot-tub soak” — something she frequently did in the evenings. Ringen’s husband, fellow BCHS teacher Johan Ringen, found her body in the hot tub. An advanced course teacher at Boulder City High, Ringen was known among students and staff for her flashy, high-heeled shoes. She was also known for making lasting impressions on her students’ lives. Ringen was runner-up for the Eagle Award in 2013, given to the school’s “most inspirational” teacher, although some would argue she could’ve won that award every year. A candlelight vigil was held Monday night in front of the school. 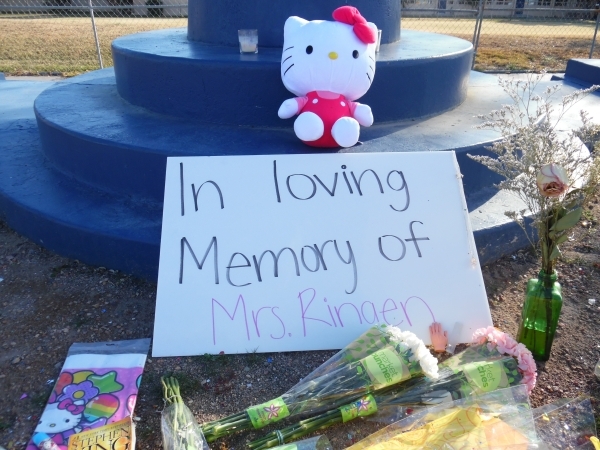 Signs, stuffed animals, flowers and candles sat in a row to honor the school’s educator. A memorial also was held Wednesday afternoon at the school. Her reach went beyond students, faculty and staff. At Tuesday’s City Council, Councilman Cam Walker spoke a few words about Ringen and her impact on the community. Principal Amy Wagner and other faculty members were not available for comment.